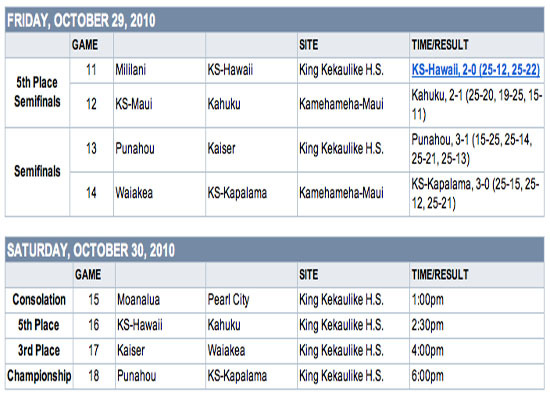 Waiakea will face Kaiser for 3rd place in Division I after a three-set loss to Kamehameha Schools Kapalama crushed championship hopes. 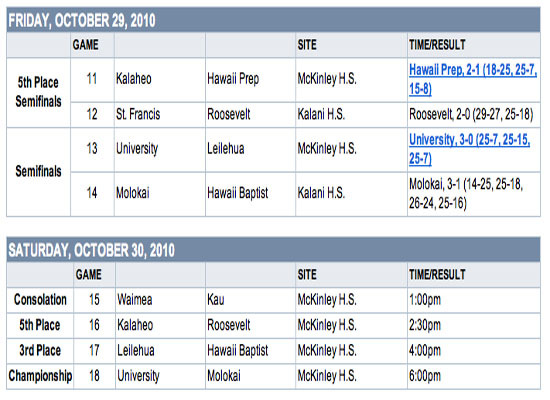 Also in Division I, Kamehameha Schools Hawaii and Kahuku will battle for 5th place. In Division II, Hawaii Preparatory Academy takes on Roosevelt for 5th place honors and Ka‘u, after knocking off Honokaa, will battle Waimea for 7th place. All matches are scheduled for Saturday, Oct. 30.